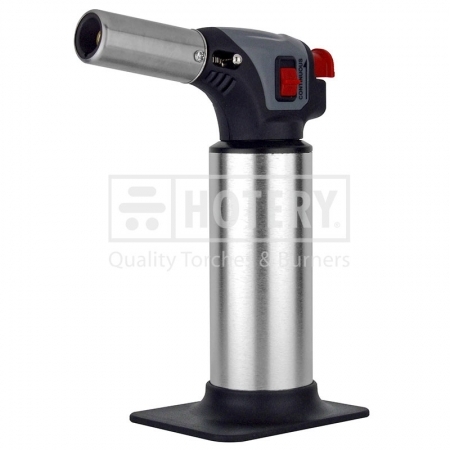 HOTERY PRODUCTS CORP. is the leading Taiwan manufacturer, supplier and exporter of Professional Chefs Blow Torch, which are engineered from the best quality raw material and are acknowledged for their sturdy construction and durable service life. During the manufacturing process, our expert teams checks the quality of the products thus we ensure the superior products to our clients. Our range is in high demand by our client spread across the international market and can be availed at industry leading prices. If you are interested in any styles of our products, please feel free to contact us. 3. Piezo start auto ignition with medium size of flame guard generate powerful flame which is ideal for caramelize meats and melting cheeses, etc. 4. Certification are known to make and use for worldwide standard. 5. Flame adjustment lever to change the desired size of flame in use. 6. Dual modes of flame support with a handheld for easy to use and refill.